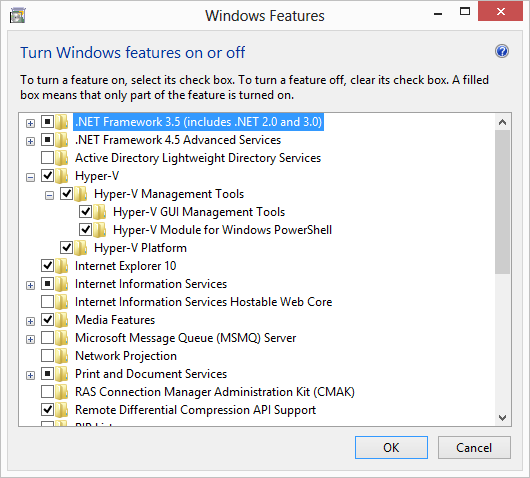 Windows 8 comes with Hyper V, but it’s not turned on by default. You have to go to Control Panel and click the link to Turn Windows Features On or Off, and then turn Hyper-V on (pictured). If you have enough RAM and hardware capable of virtualization, you can use the same full featured Hyper-V installation that previously only came with server operating systems. I always have to set up some configuration or another on a server OS, but the tools I need to author content work best on a client os, so this is a huge win for me. I installed Windows 8 on my big beefy Dell T7500 with 40 Gigabytes of RAM. I’m going to do a post soon where I detail the steps for setting up a sandbox domain on a private network. Stay tuned. Categories: Tips | Tags: Hyper-V, Win8 | Permalink.